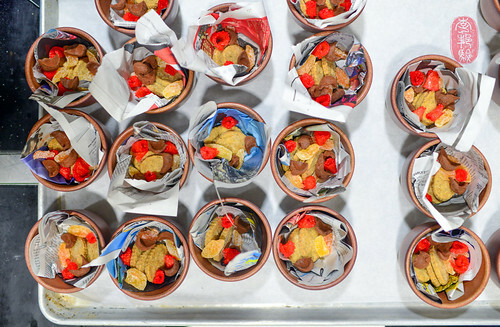 Mark Ladner and Brooks Headley, chef and pastry chef of the Michelin-starred Del Posto in New York City, are two of my favorite culinarians in America right now. Together, they are authoring some of the most elegant and exciting interpretations of Italian regional cuisine I’ve encountered this side of the Atlantic. Their approach to cooking is encyclopedic, which appeals to the academic side of my interest in food. For example, the first time I ate at Del Posto in early May of 2009, Ladner served me a bowl of zupetta le virtu alla Marchigiana, a bean soup from Abruzzo, traditionally served on the first of May to celebrate the beginning of the harvest season. But, their flavors are sophisticated, yet deeply soulful, which, ultimately, appeals to the eater in me. They marry their form of culinary anthropology with comfort and deliciousness in dishes like cacciucco – a seafood stew, most well-known from Livorno on the Western coast of Italy – which is usually on the menu at Del Posto. Traditionally, it contains five types of seafood. Last night, on the eighth night of the Twelve Days of Christmas at The Restaurant at Meadowood, Ladner served his version of cacciucco, which included clams, mussels, shrimp, and bay scallops, all of which were veiled under a tissue-thin sheet of raw, salted cod that went melty and limp like lardo when the hot, tomato-based broth was poured over it table-side. It was, perhaps, my favorite dish from this year’s Twelve Days of Christmas dinner series thus far. Ladner shot an exquisite opening volley of cannonballs, made from tuna tartare, into the dining room. The chopped fish had been mixed with Kewpie mayonnaise and puffed rice, and then rolled in freshly shaved black truffles. I loved the scattershot crunch from the puffed rice inside the otherwise silky rounds of tartare. I’ve had Ladner’s veal tonnato at Del Posto before. He served it last night – thinly shaved veal coated in a creamy, tuna sauce – with nuggets of squid ink croutons and caper sprouts. And, there was a wonderful bowl of agnolotti filled with a ground mixture veal, chicken and pork. The filled pasta was wrapped in a velvety mantle of parsnip purée and finished with a dusting of chocolate cookie crumbles spiked with espresso. From Kostow’s side of the menu came a beautiful bowl of sunchokes, enrobed in a viscous arborio rice glaze, and served with sunchoke skin chips and caviar. Anchoring the menu was a gorgeous medallion of Bryan Flannery’s dry-aged rib-eye. Kostow basted the meat with hot butter and topped it with a slice of smoked bone marrow. 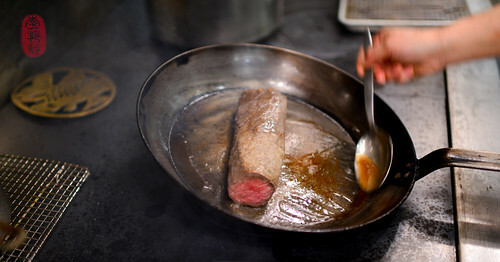 The dish was finished with a drizzle of St. Helena olive oil and bathed in warm beef broth at the table. Beef dishes are rarely this elegant, rarely this flavorful, rarely this comforting. 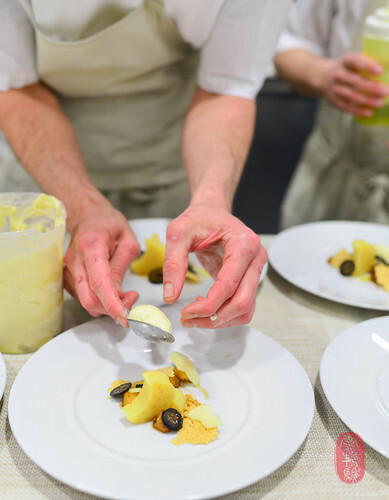 Brooks Headley’s pre-desserts usually feature sorbetto. Last night, it was sorbetto of apricot, scraped onto the lip of a bowl (I’ve come to know this as a distinctly Headley presentation) with caramel-mascarpone parfait and butterscotch. His dessert last night was based on a pasta dish that chef Fortunato Nicotra has on the menu at Del Posto’s elder sister Felidia. It’s basically cacio e pepe (pasta with cheese and black pepper) with pears. Headley made a cake out of Pecorino cheese, and served it with Pecorino chips, honey spiked with black pepper, honey gelato, and shaved black walnuts. Instead of using pears, Headley used apples last night – both roasted and raw. Like much of Headley’s repertoire and style of pastry making, this dessert walked a fine line between salty and sweet. Headley ended our night with bowls of biscotti, chocolate truffles, and candied grapefruit. The entire menu from Mark Ladner’s and Brooks Headley’s dinner, with wine pairings by the guest vintner Antica Napa Valley & Antinori Family Estate is below, along with a slideshow from the eighth day of Christmas at The Restaurant at Meadowood. If you would like to see the photos in a larger size, click through the slideshow to the Flickr album. Cured aji, fried artichokes, lemon. ~ by ulterior epicure on December 18, 2013.